There is a door in Coraline's apartment that leads to a brick wall. Once it led to another flat, but when the house was split into apartments, the door was bricked up. However, one day Coraline follows a shadow through that door. 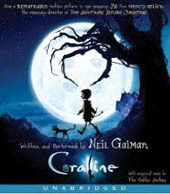 She finds there a woman who says she is Coraline's other mother. She wants Coraline to stay with her forever, and has some wonderful inducements. But they turn out to be less and less wonderful. Neil Gaiman's performance of this story is wonderful, enhanced by the incredibly creepy songs of The Gothic Archies. I chose this book to listen to on our trip to Florida because I thought my 14-year-old son would enjoy it, too. I do think I found the story creepier than he did. But tremendously well-written and well performed.